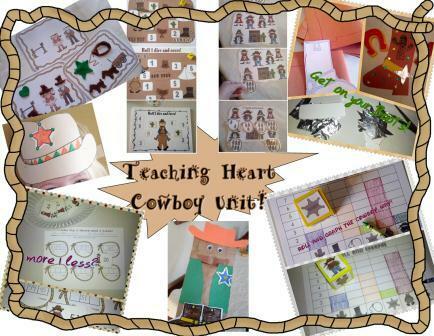 Preschool and Kindergarten Math, Literacy, and More for a Cowboy Theme or Unit!!!! Cowboy Roll and Cover—2 different versions. Page 1 is to be used with one dice. Page 2 is to be used by adding 2 dice together. Cowboy Race to Your Horses Dice Game—Fun board game. Supply dice and markers and you have a fun game for your Western theme. Roll a Cow Boy Scene—Dice Game where students roll the dice to create a cowby picture. Cowboy Western Puzzle Counting Game—Great game to teach your students during this theme. All materials and directions included. Paper Page Puppet Craft Template—Create a paper bag cowboy with this template. Lasso up 1’s—Math center for practice of 1 less and 1 more. Boot craft template / Cowboy Hat Craft Template—Use these patterns to create a paper boot craft to display and a cowboy hat the kids can wear home. Cowboy and Cowgirl Poster—Use for decoration.